Mary McGann, B.A., B.A., M.A., Ph.D.
Mary McGann is a staff member at the U. S. Geological Survey, Menlo Park, CA. 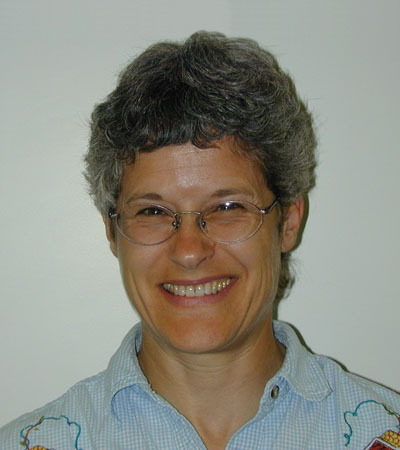 In addition t oher research, she is involved in public information and educational activities involving the Survey and the Monterey Bay Research Institute. Mary earned a B.A. in exercise physiology, a B.A. and M.A. in paleontology, and a Ph.D. in integrative biology from the University of California, Berkeley. Interferometric Sidescan Bathymetry, Sediment and Foraminiferal Analyses; a New Look at Tomales Bay, California; 2008; OFR; 2008-1237; Anima, Roberto J.; Chin, John L.; Finlayson, David P.; McGann, Mary L.; Wong, Florence L.
Foraminifera of Rocas Alijos, in: Rocas Alijos. Scientific Results from the Cordell Expeditions, R. W. Schmieder, Ed., Kluwer Academic Publishers (1996). Age and correlation of the Calera Limestone in the Permanente Terrane of Northern California; 1992; OFR; 92-306; Sliter, William V.; McGann, Mary L.
Paleoenvironmental analysis of latest Quaternary levee deposits of Monterey Fan, Central California Continental margin : foraminifers and pollen, Core S3-15G; 1990; OFR; 90-692; McGann, Mary L.
Quantitative microfossil (foraminfers and pollen) and sedimentologic data on core S3-15G from Monterey Fan, Central California continental margin; 1988; OFR; 88-693; McGann, Mary; Brunner, Charlotte A.